I've spent the last 8 months immersed in the world of Westeros. Westeros, for those not in the know, is the fictional land where the book series, A Song of Ice and Fire, and the TV series A Game of Thrones, takes place. There's 5 books in the series, 6 if you take in to account that the third one is split in to two books, and they are big reads. Like 800-1000+ pages, big reads. I started the first book on Christmas Day (sweet little Christmas present to myself) and finished the last one a few weeks ago. There's rumours that the next book, Winds of Winter, will be out some time soon, but I'm not holding my breath. The author, George R. R. Martin is notorious for taking a very long time to write each novel, and it's no surprise given the sheer number of characters in the story. I imagine it takes a lot of planning and organisation to create a story so richly detailed. The thing is, despite how much I enjoyed reading the books, I was a little relieved to get to the end of the last one. I really needed to get my head out of Westeros for a while. Since then I've started a new trilogy of books by Hugh Howey, the first of which I finished last Wednesday. I won't say much about the series as I am saving it for a post I'm currently writing. Which brings me to Reading Writes. There has been a decided lack of posts on the blog this year about one of my life-long passions, reading. In fact, there's only been 3 in total. There was this one from last month on the latest Dymocks Top 101 Books List and 2 way back in January. This one about books, and how many I own, that gave a little visual of the chaotic state of my 7 (yes seven!) bookshelves, I wrote for a Lounge theme post. And then I also wrote about my Top 5 Literary Character Girl Crushes. For someone who used to fancy herself a bit of a book blogger, this is just woeful. So in an effort to right the wrong, I've decided to dedicate the first Tuesday of every month to a book related post. It might be a review of a book I've just finished, a little something on some of the books I have sitting on my shelf and at the top of my To Be Read list. It could be a post about a favourite author or some other book/reading related topic. Either way, I'm going to get back in to the habit of writing about reading regularly, and I'd love you to join in with me. I know there are a few of you who share my love of books and reading and may just get a kick out of this. I also know there are plenty of you who love reading but just don't get the time anymore. In fact, for some of you, the most reading you might get done in a month is reading the weekly shopping list or your kids home readers from school. I don't care though. I'd really love to hear what everyone has been reading, or wanting to read, or planning on reading once their kids and houses learn to look after themselves. If you're writing a novel and what to share something about the writing process, or you've learned a new word that you want to share. 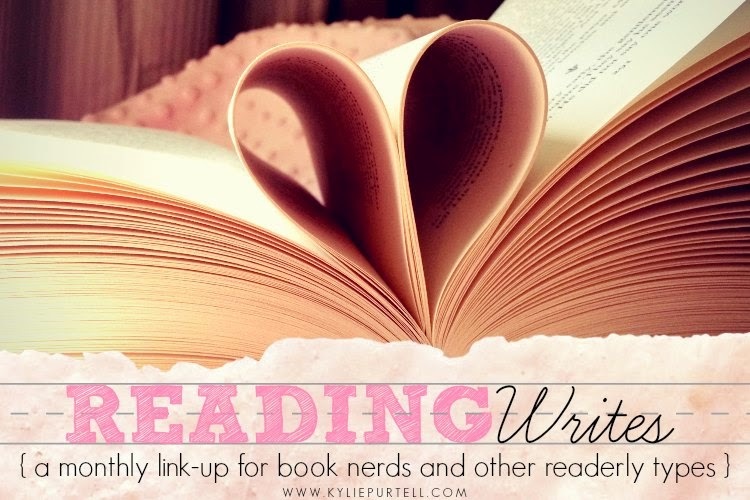 Or even if it's just a post about some of the great blogs you've read lately, like my Linky Lovin' Fridays posts, or a post that simply has the words 'books' or 'reading' in it somewhere, I'd love you to link it up. You don't have to write your post on the first Tuesday of the month, you can write it at anytime in the month before, or after, and come link it up. The linky will stay live until the final Tuesday of the month, with a new one opening up the first Tuesday following. So who's with me? Anyone else keen to get on this bandwagon with me and share what you've been reading (or not reading!) and writing each month? Please tell me there are at least a few of you, because let's be honest, there is nothing so lame as hosting a party that no-one shows up to! Are you a reader? Do you ever blog about reading? What have you been reading lately? Please Note: The original version of this post said that Reading Writes would be on a Thursday, but I've changed my mind. It's now gonna be on a Tuesday so those that want to can double-up with their IBOT post! Linking it up with Essentially Jess today because I'm a blog nerd who always blogs on Tuesday! Sounds like fun! Is there anything better than reading about reading? Love it! I'll definitely be joining in. It will give me a kick up the but to write the reviews I've been meaning to! Super idea Kylie! I'll watch keenly and I might even be spurred on to finish that book I started 6 months ago! I'm going to do my best to join in with this, and please keep me accountable! I'm trying to read more lately, and I'm remembering the love of it, but it's just time. I love too many things. But I'm going to be committed!!! I am a readerly type and strangely have never written about reading other than one post about reading with my daughter. I think I'm going to have to remedy that! Make sure you remind me! I'm looking forward to this one! Are we talking fiction, in particular? I ask because the three most recent book purchases of mine happen to be humorous memoirs (all signed by the authors at promotions). I wish I read more. When you consider that applies to multiple blogs too, the books are truly not getting loved enough. Brilliant idea, Kylie. I'm in! We are talking anything at all Twitchy, humorous memoirs definitely count! Yes, you should most definitely remedy that. And then come link up, lol! Time is the killer to reading pleasure, isn't it. That and kids! Thanks Em! I always feel happier when I can get lost in a good book. It gives me an escape without having to leave the house! Hahaha, yes, get on that, books make for great blogging fodder! I know what you mean, I have fallen right of the review wagon the last couple of years. Damn kids! I'll be linking my book reviews every month! Thanks for hosting.